At our March 20 dinner meeting, Todd Orbus, Deputy Project Director, Kiewit, gave an engaging presentation on the massive Oroville Dam Spillway Recovery project. 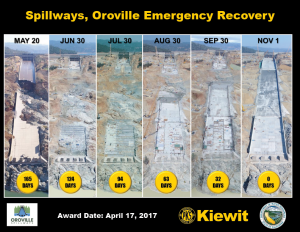 Kiewit began work on the damaged main spillway on May 21, 2017 and had just 165 days to complete the first phase of the repair to get the 3,000 foot long main spillway operational by November 1, 2017. Mr. Orbus explained some of the most challenging aspects of the successful project have been to get the hundreds of workers and critical equipment in place. Technical challenges included major demolition work, dealing with highly variable conditions in the natural rock underneath the spillway, installing a new secant wall, and managing the placement of hundreds of thousands of cubic yards of concrete. The Construction Institute also announced that its student scholarship program will be named after Joe Kaplan, the Institute’s long-time Senior Advisor who recently passed away. Approximately 45 people enjoyed the evening’s dinner and presentation.